The DCC has shared in expeditions to Matienzo since the early 1970s when Barry Davies, who had been at Manchester University, went with the Manchester University Speleological Society. Members of the DCC have been in Matienzo for most summers since then. The 2003 expedition was marked by the discovery of an extension to Site 489, known as Billy's Vision as Billy was determined to push it having dreamt about the extension several times. In , several caves were visited and 489 was visited again. However, a lot of the digging was concentrated on three sites close to the main road leading north out of the valley. Also in 2004, we paid our respects to Roy Hayes who died in December 2003 and who played a significant role in the 2003 expedition. Members have been each year to Matienzo, sometimes going at Easter as well. The expedition in summer 2010 was the celebration of 50 years of caving there, 40 of them by the MUSS members (and pensioners). A fiesta was held in August to thank the local people for their support and tolerance over the years. Slides from slideshows at the Wizard in 2015 can be seen in Matienzo Past (1976-2014) and Matienzo Present (2015). Below is a brief description of Matienzo and what draws the cavers to it. Where and what is Matienzo? 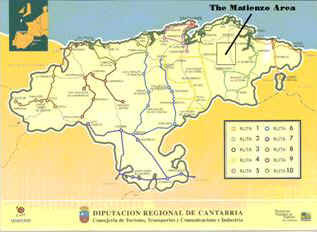 The village of Matienzo lies in the eastern part of Cantabria in northern Spain. The area is a green and fertile part of Spain with lush vegetation overlying limestone rock, a formula for the development of good cave systems. The area was first visited by British cavers in the 1960s and the DCC has been sending cavers to join the annual expeditions since 1976. 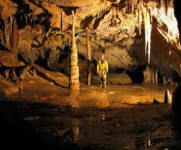 The caving area we visit is located in a huge closed depression, a valley from which the only drainage is underground. The valley was first recognised by the original explorers as having caving potential because some mornings it fills with mist, there being no way for the mist to escape. There are three communities within the valley, La Secada which is the northern arm of the valley where we camp and where German's Bar is found, Seldesuto which is the western arm of the valley, and the main village at the centre of the valley where the Baker's Bar is located. 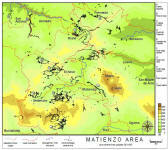 Picture: Map of northern Spain showing the Matienzo area; below: a view across part of the valley. The caves are scattered all around the valley and as time has gone on, the explorers have come to realise that there is probably no part of the valley where caves will not eventually be found. The map shows the main cave systems of which there are four of greatest significance: the Four Valleys System (cave entrances in four separate valleys which all connect underground), the South Vega System (at least five separate entrances), the Cubija System and Valline (outside the valley but likely to be connected to the South Vega system somehow). The Vega system is over 300 metres deep and all the systems feature in Spanish record books because of their total length: Four Valleys 41 km, Valline: 25 km and South Vega: 22 km. In 2010, the Four Valleys system was the fifth longest cave in Spain. However, these are only the cream on the cake, there are now over 2000 recorded cave sites in and around the valley ranging from single shafts in the limestone to huge old caverns high up on the hillsides. Picture: A view across part of the valley. Some caves are still found by the expedition team members walking across the hillsides or talking to local farmers. However, other finds now need to be dug out or cleared of debris to allow cavers in. The DCC members have a reputation for digging in Matienzo and the expedition leader usually has a few digs ready to hand out to our team when we arrive in the valley. In 2003, DCC diggers opened up 100 m of new cave at a site known as Billy's Vision. Apart from digging on the surface, there are always opportunities to take part in underground exploration. Sometimes, this can mean entering new cave for the first time ever - going where no one has ever walked before. Other types of underground work include digging, surveying, photographing, climbing, diving and even filming. Every year, there is usually at least one significant find and even if you cannot get onto the first pushing team that is trying to enter new passage, there is always a chance to join a team and maybe find a lead that someone else has missed. If not, then the caves still need to be mapped and photographed. Apart from the caving, there is plenty more to do in Matienzo. The valley is not too far from the historic caves at Altamira and the Picos de Europa is only a couple of hours away making a day trip walking there quite an easy expedition. There is also the river Ason if you want a cool swim. However, Matienzo would not be complete without the bars and restaurants. Sadly, there are fewer bars than there used to be with only two operating in the valley when there used to be at least six, but that is progress. Nevertheless, German's Bar, run by Pablo, still stays open until the early hours and serves good meals as well. 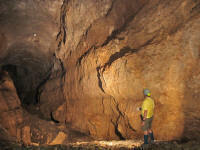 It is quite easy to get on the expeditions if you are a capable caver and prepared to take out the necessary insurance. 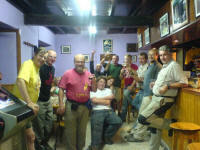 There is a vast amount of information on the expedition website at www.matienzocaves.org.uk. For the last few years, between five and fifteen members of the DCC have joined the expedition each year and we enjoy close friendship with the other expedition members.